The Crown held a party at Christmas every year for local children. ____?, John Short, Peter Short, ____?, Roger Short, ____?, Lynda Burr, Ernie Siggers, ____?, Ellen Burr, ____?, ____?, ____? 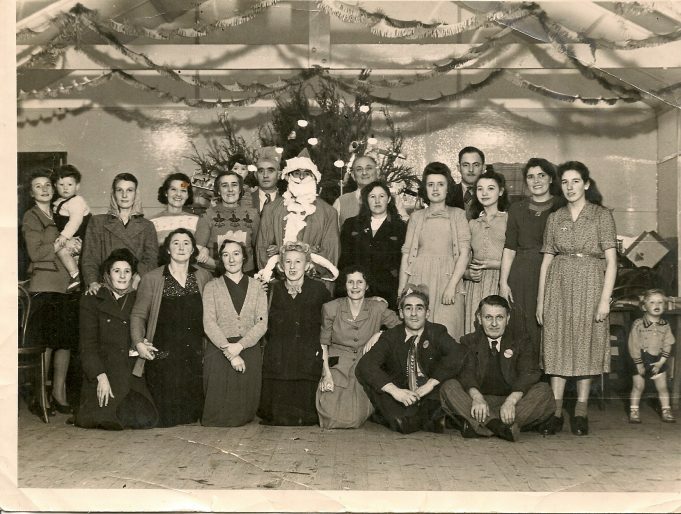 Adults and children at the 1949 party. I live in Laindon from 1938 to 1967. Hi Ellen, I would love to have copies of the photos that would be great, can the editor give you my e-mail address? Ivan, my husband, also thinks the third little boy from the end sitting next to you is Tony Hurley, his mum is in the grown ups photo. Thanks again Ellen. Editor: We will be delighted to do this Lesley. Hi Lesley, I had wondered if you knew of the Archive site, it brings so many memories of our childhood/school days and friends. I am not sure whose lap you are on, she looks familiar but can’t come up with a name. I can remember Tony Hurley at about the age of 10 or 12, not sure I can place him at such a young age.I think it is highly likely he is on the photo though as his dad did use the Crown. 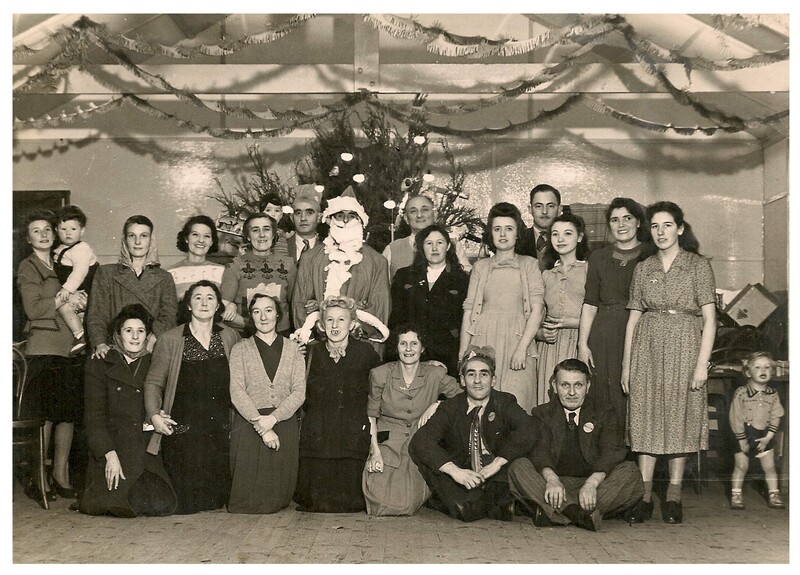 Sid Short ran the Christmas Loan club up the Crown, I think the parents or some other means came up with the money for party or maybe the Landlord Bert Blundell put it on for us. Ellen where on earth did you get that photograph from, I have never seen it before and never knew that I, or my family went to a party at the Crown. 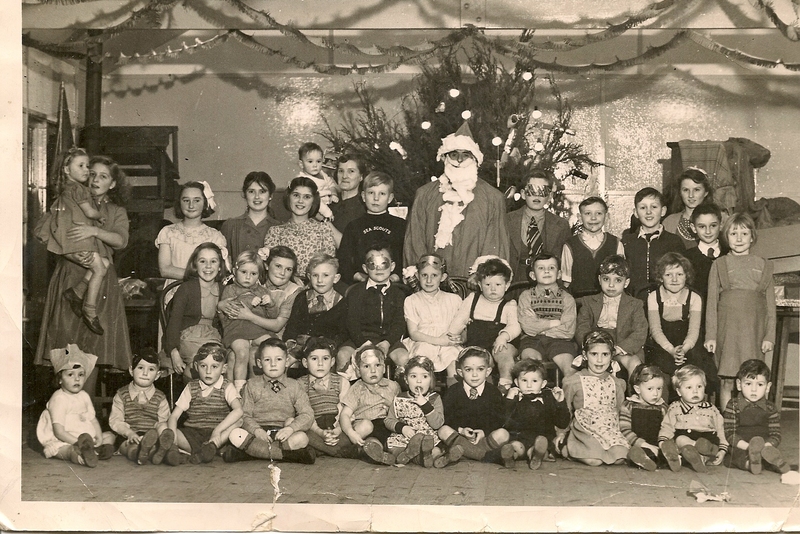 The lady next to my mum is my aunt May, Roger Shorts mum and is the little boy next to you, Tony Hurley. I would love to know whose lap I am seated on? The one on the left looks familiar? Hi Ellen, thank you for the info and pics you have kindly posted on site. Memories are made of these, so many that come crowding back of the very narrow path to walk on, the horse and cart from Firmans delivering milk, my cousins the Hopkins were involved. Jackie Webb, Rose, Joany, Betty Grover, Mr Reid, Eric Cole and your family in the last house on the left at the top of nightingale Ave. keep the memories coming please. The first and second persons in the back row of the first photograph are Elsie Freeman (my grandmother) holding her youngest son Henry. They lived in Butlers Grove. Hi Ellen, Thanks for putting these 2 photos here. It’s nice to see mum when she was young (especially now she’s no longer with us), and Alan and my Grandad too. There are a few others that I recognise as well, your Mum, Betty Hurley, Ray Buckingham and of course Aunt Dot – she never changed, bless her. Would these parties have been held in that large hall out the back of the pub? Hi Richard, my younger sister Lynda Burr born 1947 did go to the High Road. I am afraid I don’t remember whose class she was in, she moved to Cumbria when she was 17 and lived there until she passed away in 1999 age 51. Hi Ellen, yes Lynda would have been in my year if born 1947, I am so sorry to hear of your loss. A consolation would be that Cumbria is a lovely place to live and I am sure she had some happy times there. Thank you for posting the photos, they are so nostalgic and typical of the post war years. Ellen, thanks for all the details about Nightingale Avenue and about some of the names. Certainly I think I remember your sister’s name, Lynda Burr. If she was at the High Road School she would have been in the same year as me and Lesley and Cherry. It would be great if you could confirm whose class she was in. One of Mr Rees’s familiar sayings would be ‘Lesley and Cherry, stop talking’. Or to me ‘this Haines fellow, who does he think he is?’ Wish I was back there now. Hi Richard, when we were young Lesley used to play mostly with my younger sister Lynda Burr, they were the same age. We and Lesley lived in Nightingale Ave, the first turning on the left when you went up Lee Chapel Lane, Cherry lived down near the station, Osborne Rd. I believe it was mostly children from Lee Chapel, Dry Street and other surrounding unmade roads. Nightingale Ave comprised of my family first bungalow going down on the right, the Burrs, then the Russells, then Stows, then Webbs, then Cousins, then Moores, then Grovers, then Markins, then Donovons and then the Nicholls family. The mother was a teacher and there were four children Mary, Elizabeth, Jenny and I believe the boy was David. Next to them lived Mr Read the head postmaster at Laindon Post Office. Then on the left hand side lived the Coopers, the Hopkins, the Borets and then to the left you came out at Park Avenue where Victor Hurley lived in the corner house. Nightingale Ave, ran parallel with the High Road all the way down to the station but I only know the families at the top end. Hi Andrea, Merle and I used to play with each other a lot, as there were not always children exactly the same age as yourself. Merle was two years older than I and we mostly used to do painting as a pastime. I have had contact with her a couple of times over the years, ie when my mum died, when her mum died and when my younger sister died I got in touch. The last I heard she was still in Romford, divorced and no children. She really did have a thick head of hair I agree, I still live locally. Ellen, thank you for sharing these nostalgic photos with everyone on this site. 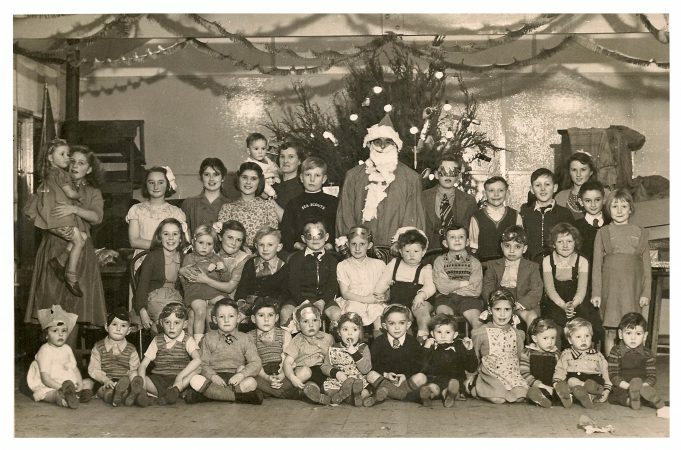 With Christmas coming up once again it is good to see how it used to be celebrated in a close knit community as Laindon was. The twisted paper decorations, the big glass lights on the tree and the hats of the children remind me of my own young childhood Christmases in Barking. I only recognise one person, the two year old child on the lap, Lesley Cousins who was in Mr Rees’s class with us at LHR. I wonder where Cherry Walden was that night, those two were inseparable at the High Road School!! I know several of these names but the one most that stands out is Merle Buckingham – I have often wondered what happened to her. She had the longest, thickest, auburn plaits and she was always out and about with her mum.